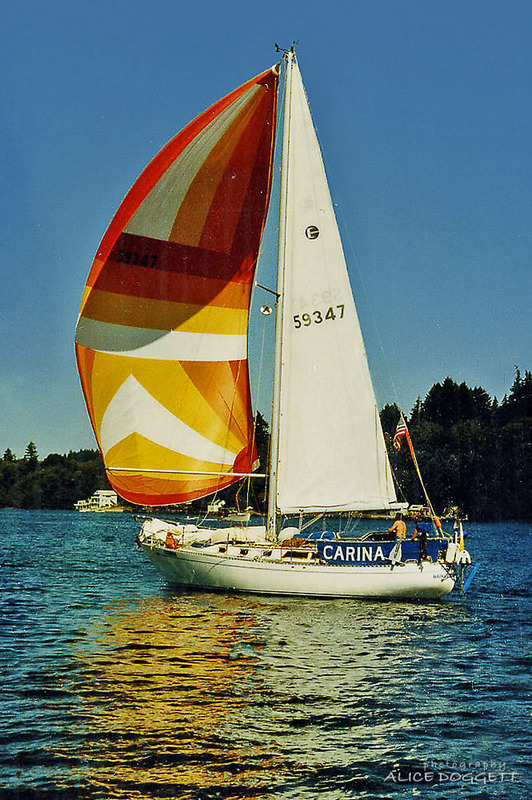 This is one of the few photos we have of us sailing Carina, our Valiant Esprit 37, with the spinnaker flying. Our friends caught us as we were sailing in Puget Sound in 1984 just after returning from our cruise to Mexico and Hawaii. Carina was still outfitted with the boat name on the weather cloths for better recognition at sea, and our wind vane was still mounted on the stern. As we prepare to start the new year of 2014, we’ve been reflecting on friends and memorable events from the past. In thinking about New Years and our boating, what came to mind was the New Years we spent in Mexico 30 years ago. 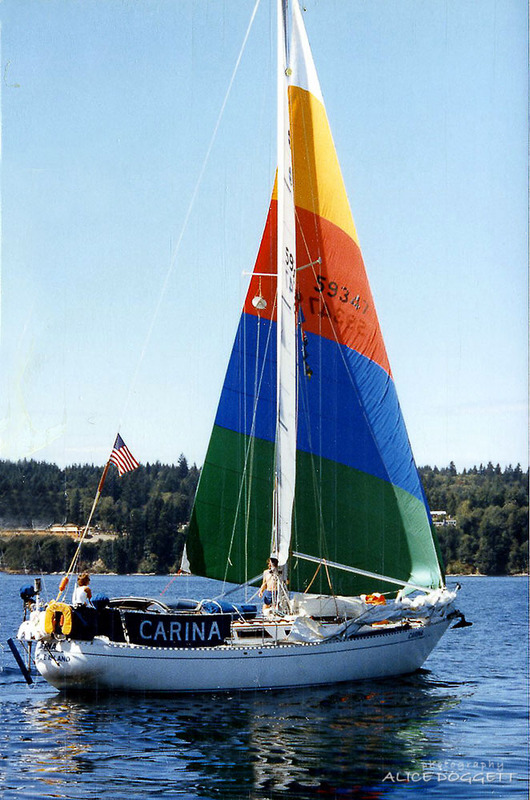 We had sailed Carina, our Valiant Esprit 37, down the coast from Washington State. 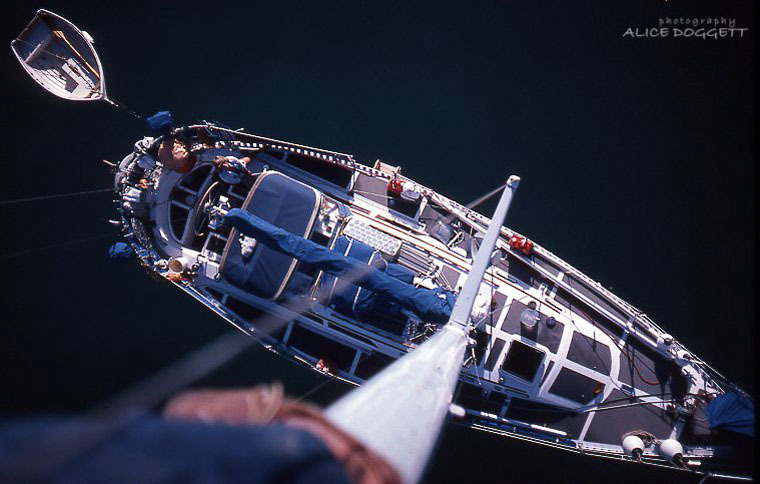 We left Neah Bay, WA on August 9, 1983 and spent the next three-plus months sailing down the West Coast. We arrived in Cabo San Lucas on December 22, 1983. Alice basking in the warm sun in the bow of Carina as we approached Cabo San Lucas. After 8 days at sea on our sail from San Diego, we lost the wind and had to motor the last 8 hours to reach the anchorage at Cabo. 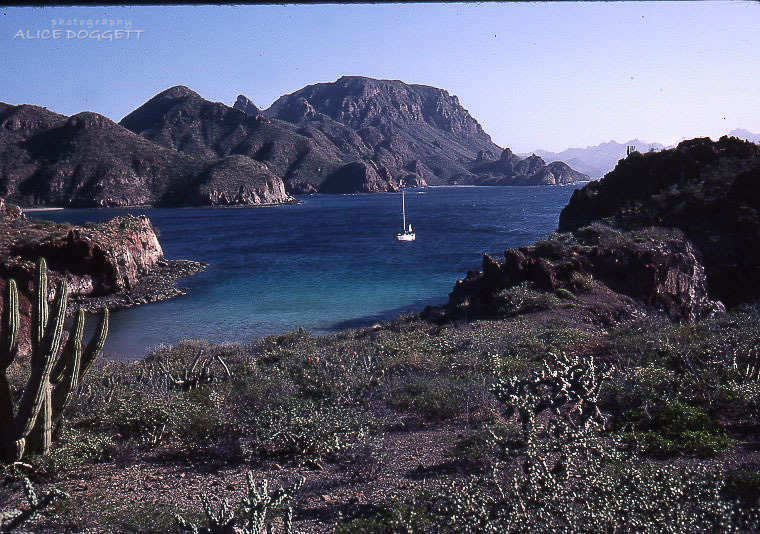 The rocks at the tip of the Baja Peninsula are visible in the distance. 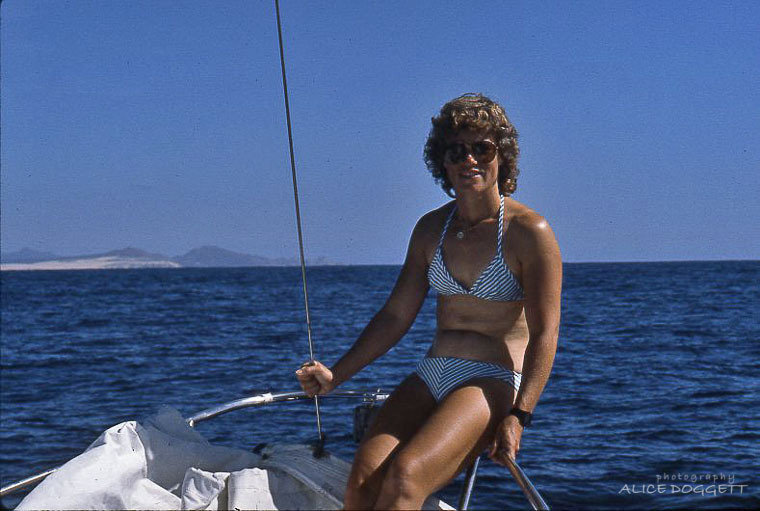 New Year’s Eve 1983 found us departing Cabo San Lucas before dawn to sail to Los Frailes and points north in the Sea of Cortez. We left early, hoping for lighter winds and calmer seas as the afternoon northerlies had been blowing hard for the past several days. It certainly is fun to look back on that New Years experience, as well as the entire four months we spent sailing in the Sea of Cortez before we departed from Cabo on April 14, 1984 to sail to Hawaii. Thought we’d share a few of our photos from cruising in Mexico 30 years ago and wish everyone a Happy New Year and fair winds/following seas for all your 2014 boating adventures! When we were cruising with our friends, we tied our dinghies together on the beach for more security. We found a kind person to take a photo of the four of us. The beach at Cabo was incredible! 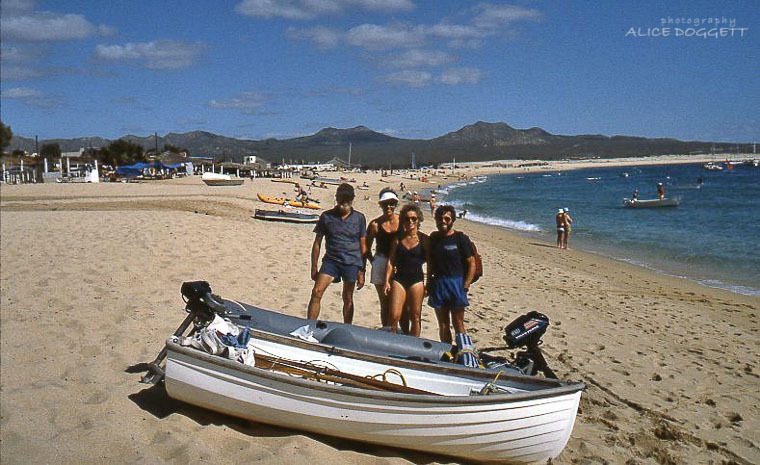 We used our inflatable dinghy with its outboard to reach the beach in Cabo. 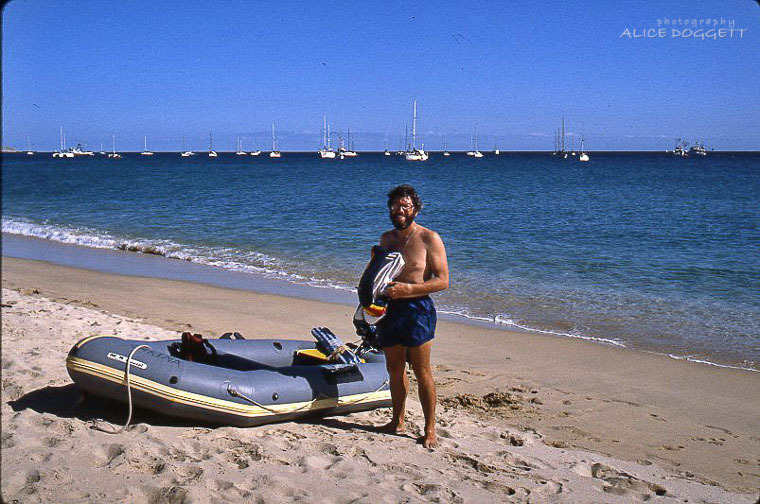 Jim is on the beach with the inflatable, and the boats at anchor, including Carina, are in the background. 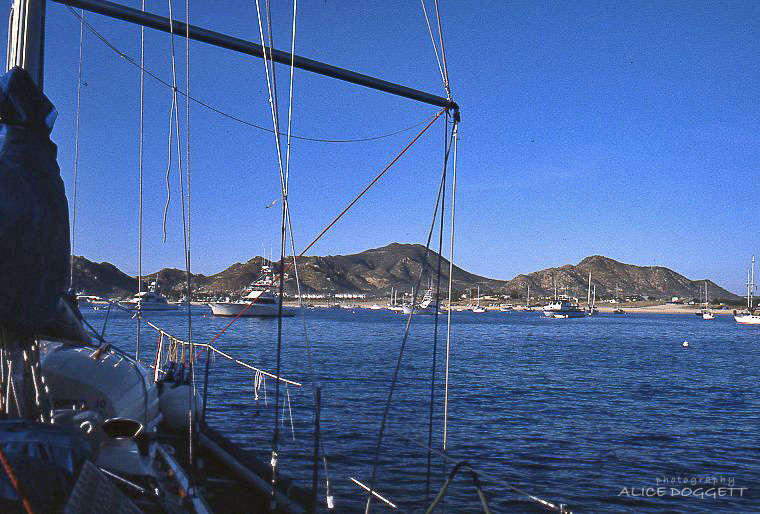 We anchored off the beach at Cabo where we had swells most of the time. We hung a flopper-stopper from our spinnaker pole to dampen the obnoxious rolling. This view show the rigged flopper-stopper with the beach and town of Cabo San Lucas in the background. Carina at anchor at Isla San Francisquito, one of the beautiful anchorages near La Paz. We raised Jim to the top of the mast to fix our wind point instrument while we were anchored at Isla San Francisquito. He took the camera up with him and captured this neat photo of Carina’s deck. I was working the winch to raise/lower him. If you look carefully, you can see me in the port side of the cockpit hanging onto the line wrapped around the winch, and our kitty cruising companion, Frosty, lying on top of the dodger. Our hard dinghy, Pyxis, is streaming behind the boat. And of course, that is Jim’s foot in the blurry foreground. Carina is at anchor in Honeymoon Cove, near Escondito. 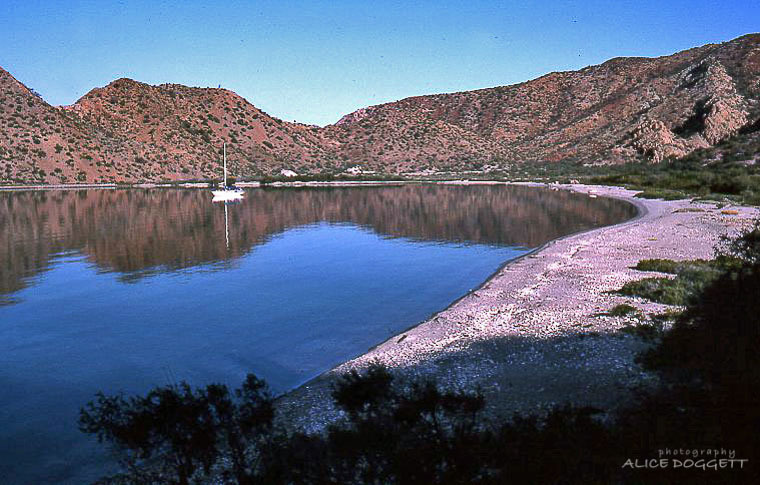 This was a scenic anchorage, with reefs on both sides and just enough room for one boat to anchor and have enough space to swing on the anchor without hitting the reefs. We got caught in a strong wind here and had to set both anchors to avoid swinging onto the reefs. A full moon at night helped us keep track of our position to be sure we weren’t dragging. 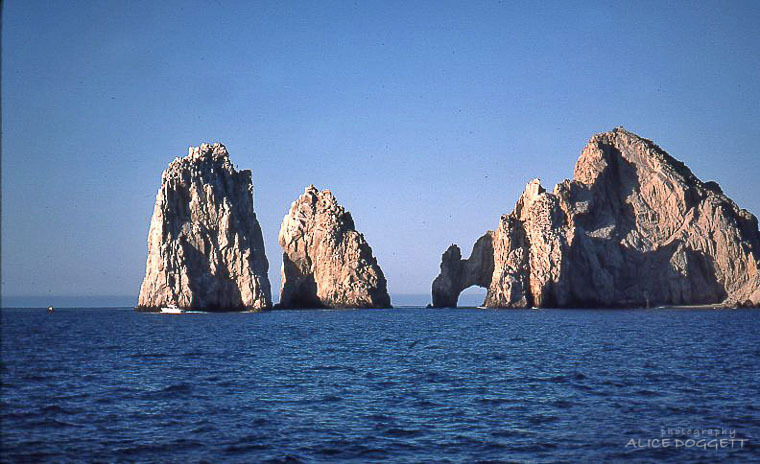 The distinctive landmark of Cabo San Lucas is the rugged rock formation that erupts from the sea at the tip of the Baja Peninsula. 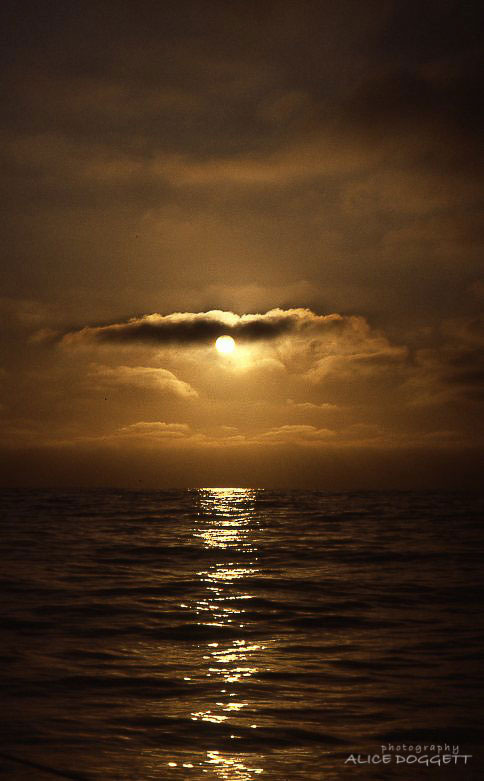 One of the gorgeous sunsets that we enjoyed while we were at sea. Carina under sail in light air, using our favorite drifter. You can view the slideshow on our Welcome page for more photos of our ocean sailing with Carina….and photos of Phoenix cruising in B.C. and Alaska. Finally, in the spirit of the season, I’d like to share this beautiful rendition of Auld Lang Syne by Sissel. It’s one of my favorites. This entry was posted in Cruising, Life Aboard, Travel, Weather and tagged Cabo, Cabo San Lucas, Carina, cruising in Mexico, sailing in mexico, Sea of Cortez, Valiant 37, Valiant Esprit 37 by Sailor Lady. Bookmark the permalink. Great memories last a life time. Here is to another year and more great memories, Bobbe and I just returned from hiking to the top of Australia, Mt Kosciuszko, 2,228 meters high. Bob, Sound like a great hike! Sounds like this year in Australia might be a memorable New Years for you and Bobbe. Enjoy the rest of your vacation. Happy New Year!